One of the constants in the world of RPGs is Chaosium’s horror classic, Call of Cthulhu. Through six iterations, Sandy Peterson’s variation on Basic Role Playing has remained pretty consistent. Unlike its Sword and Sorcery peer, Dungeons & Dragons, whose different editions are completely different games; Call of Cthulhu was stalwart in its consistency. Oh sure, things changed, the game evolved, adding new terrors, tomes, and spells; honing the system warts and all. Even as its parent game, Basic Role Playing had gone through significant structural changes (and I lament its current downsizing), Call of Cthulhu just…grew, for lack of a better term. One Kickstarter later and all of that has changed. The first thing that I noticed was that the re-printing of H.P. 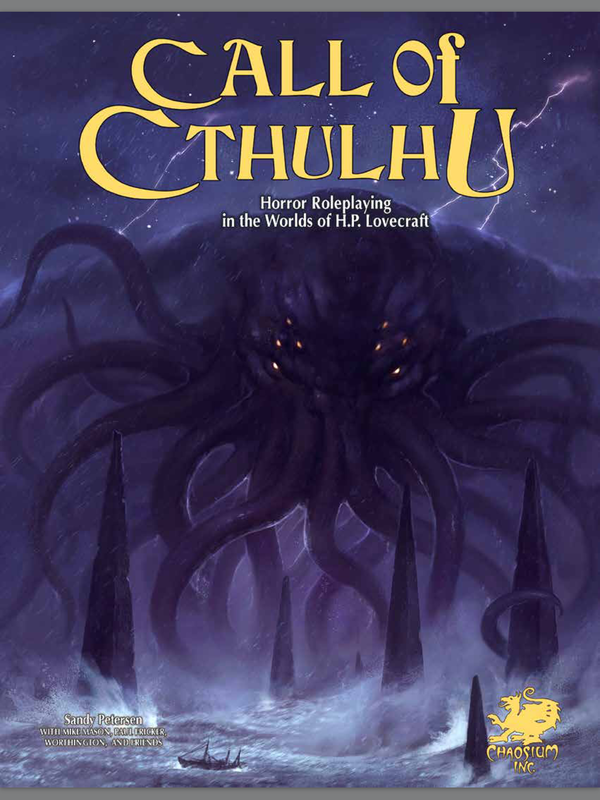 Lovecraft’s story, “The Call of Cthulhu” was noticeably absent from the book and the story, “The Dunwich Horror” replaced it (in the Investigator’s Handbook only, the main rulebook reprints no story). While the game itself is named after the “The Call of Cthulhu,” the spirit of the game definitely owes more to “The Dunwich Horror” than to any other Lovecraft story. The look of these books is also different than the past incarnations. Gone are the watermarked images and the burned margin look; with full color illustrations and a professional looking style, the quality of the layout stands out. While style is important, it is the content that truly makes one want to play the game. The mechanics have been not so much as changed, but overhauled. Seventh Edition still uses the same mechanic as previous editions of the game, but now uses a significantly streamlined version. Unlike previous editions, your rolled characteristics are automatically multiplied by five making a better target number for percentile rolls; so the math is calculated during character creation, rather than when a specific roll is needed. The game still uses skills as the basic operational tool, but the mechanics of these have been tweaked. Now if you fail a roll, you can push the roll and retry, taking a penalty if you fail again. Gone is the lamented resistance table (more on that later), replaced by opposed checks complete with bonus/penalty dice for added dynamic tension. Most of these changes are fairly compatible with earlier editions and conversion is fairly simple and the new edition’s supplementary materials provide an easy conversion guide; so you won’t have to buy all new versions of the materials that you already have and the new material can be converted backwards if you want to play with an earlier rules set. Combat has been revamped, this may seem a moot point in Call of Cthulhu, but if you like a good pulp-ridden slugfest like I do, you are going to want to have a combat system that adds a little punch to your game. The new stat, Build, brings size and strength into your fisticuffs and the traditional fist/kick/headbutt trilogy of hand to hand combat is replaced by Brawling. Do you want to use your companion’s strength as a springboard to bodyslam the guy who just sent your other mate into a fit of incoherent screaming? Now you can perform that maneuver, and there is a mechanic for it. Firearm use also gains a new rule set that more reflects the chaos of guns in a melee. All in all the revamped combat allows for some exciting scenes. Damage has also been modified to reflect different types of injuries and recovery from brawling is a lot different than that of a Shantak’s claws. Lots of new and different rules require lots of new and different referencing and several flow charts for managing combat and wound management are conveniently provided. And hit locations are back on the table as an optional rule. One of my favorite new features is the rules governing chases. Want to upset a cabbage cart to put an obstacle in the way of that cultist? Need to track a hunting horror through the maze of Harlem in traffic? Well now you can. Instead of simply looking up relative speeds and resolving the race using the resistance table (see, I told you), there is a whole chapter outlining the fine art of the chase; from using skills, utilizing hazards and obstacles to vehicular combat it is simple to have a great chase scene in Call of Cthulhu without sacrificing the randomness and excitement. Another renovation that helps bring CoC into the modern age is the inclusion of a Luck economy. Systems like D20 and Fate have been using an economic-model of game altering mechanics for a while, whether it’s called a Hero Point, Moxie or a Fate Point; there is a limited supply of points that can affect the outcome of die rolls or power extra efforts. Seventh Edition has taken the attribute of Luck and created a similar system. Luck can be spent to add a few points so that that Hide Roll succeeds, avoiding the baleful gaze of some dripping horror. Chaosium is also taking a cue from modern games and placing a premium on role-playing. Part of the character creation process calls for a backstory, complete with ideologies, significant people, meaningful locations, treasured possessions and character traits. In past editions of Call of Cthulhu, characters were relatively simple to throw together, with little thought put into backstory; effectively creating disposable characters. And the game really wasn’t discouraging this practice. Sure, players can (and do) create elaborate backstories, and role-play these characters really well, but the game itself never lent itself to this behavior. Seventh Edition not only encourages backstory and role-playing, but is designed to for Keepers to exploit this by linking a character’s background to sanity and recovery from encountering -eldritch horrors. As many of the new rules are optional, groups are free to pick and choose many of the new rules to tweak the game to their own preferences, so if you want to run a more fast and lose pulp-style campaign or are of a more traditional bent, there is something for you in the new rules. My biggest complaint is that the skills are still based on your investigator’s occupation, rather than tied to the appropriate characteristics and I am somewhat saddened by the loss of the resistance table (sorry Burly Bob, I’ll miss you). So if you’ve never played Call of Cthulhu or you are a grizzled veteran of a thousand psychic wars grab a copy of the pdf (print soon, but not soon enough) and get crackin’.